The first stamps, printed at the Cape of Good Hope are a true dream for any philatelist. They were the first stamps of Africa and the first stamps of an unusual triangular shape. The idea to issue it's own postage stamps appeared at the Cape of Good Hope as early as in 1846. On this occasion, there was issued a special order, and the London printing house "Perkens, Bacon & Petsch" even received the order for the matrix and the plate, but soon that order was canceled. In August 1852 a request came back again, but the project had already been changed. The stamps were to be triangular. There are many hypotheses about the unusual form of those stamps, sometimes very exotic. However, the true explanation has a rather prosaic nature. At that time, in the post offices, especially in the outback, were working many local residents, who were almost illiterate and sorting the letters, many of them could not distinguish between the internal correspondence and the letters that have arrived from abroad. This led the General Postmaster - Charles Bell - to the idea to release a stamp of unusual shape, which would easily allow the illiterate postal employee to distinguish the nature of mail. Bell prepared a sketch himself and sent his order to London. 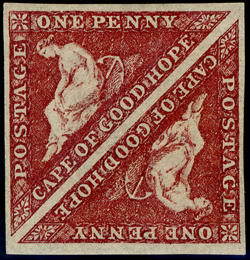 Stamps of the Cape of Good Hope were printed by "Perkins, Bacon & Petch," they went on sale in September 1, 1853 and immediately became very popular. In 1860 the stocks of those stamps were coming to an end. The next stamps from London were late, and the postal authorities had to order a small batch at the local print shop - "Saul Solomon & Co». The firm fulfilled the order, though it's products were executed in a quite simple way. However, it was already too late to correct something and the stamps were received in the appeal. These stamps were in-formation from February 23, 1861 to April 1862. Among collectors, they were called "Wood-blocks". The fact is that the plates were prepared by woodcuts. This technology is applied today as well. The original plates are cut from the solid wood (yew, etc. ), then from this plates there are made molds (eg, gypsum) in the number of stamps in sheet, and semi-finished form, electrolytically there was deposited metal - and the shape were ready to print. It should be noted, that there were two stamps, identically-figured, but of a different denominations: 1 penny - of a red color and 4 pence - of a blue color. When assembling the printed form, there was made a mistake - one element of 4 pence stamp got in the shape for a penny stamps, and, accordingly, "extra" element of the stamp for a penny, also was in "another" plate. The result was a rare mistake - there were two stamps with the "other's" color. For the mail service and for people it did not matter, as illiterate population was focussed on the color of stamps. "Woodblocks" with this color mistake became famous among the philatelists thanks to two English sailors, who brought from Cape Town in 1863, a package with the "tricorne" stamps. After receiving those stamps as a lottery winning, they decided to get rid of them, and so they sold all those stamps to young Stanley Gibbons, who traded in his father's drugstore - he was selling potions and postage stamps. In this exactly package Stanley Gibbons found this unique stamps. People say that this happy discovery, and a large sum of money that was received by Stanley, marked the beginning of his career and the beginning of the world-famous philatelic firm "Stanley Gibbons."